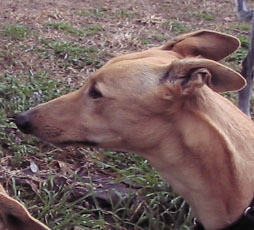 Millie, aka LRC Bad Lil Girl, is an almost 6-year-old red fawn female born March 7, 2006. Her sire is Ben Awhile and her dam is LRC Adios Amber (GALT's Amber). Millie has 21 races to her credit on Greyhound-data.com, all at the Naples-Ft. Myers track. She started on March 2, 2008 and raced her last race on June 5, 2008. Millie has been in a home since the end of her short career, but has been surrendered to GALT due to owner illness along with Amber and Angela. Pay no attention to her racing name - this little girl isn't bad at all! Millie is not cat tolerant.